We’d love your help. Let us know what’s wrong with this preview of Trial By Fire by Eric M. Hill. Reverend Edwin Styles and his family were battered and bruised in the onslaught they suffered in Bones of Fire. The murderous warlock, Anthony Righetti, and the great warrior demon, the Mighty Bashnar, showed the Styles family that there is a terrible price to pay for not understanding and for not engaging in spiritual warfare. Now in Trial by Fire, the battle for Atlanta c Reverend Edwin Styles and his family were battered and bruised in the onslaught they suffered in Bones of Fire. The murderous warlock, Anthony Righetti, and the great warrior demon, the Mighty Bashnar, showed the Styles family that there is a terrible price to pay for not understanding and for not engaging in spiritual warfare. Now in Trial by Fire, the battle for Atlanta continues. The Mighty Bashnar is back with special authority from heaven to overwhelm the Styles’ family. It’s his Job Strategy. The plan is simple: Overwhelm them with non-stop troubles and tragedies. But there are other demons who feel the Mighty Bashnar’s success has gone to his wide head. They connive to steal his victory. Unfortunately, for the Style’s family, this means other high-ranking demon spirits want to destroy them before he does. Edwin. It’s grow up or die. Barbara. You’re in more trouble than ever before. Sharon. Your faithfulness to God has attracted special wrath from the kingdom of darkness. Andrew. The Mighty Bashnar hasn’t forgotten you. Jonathan. Always a big threat; always a big target. Elizabeth. It’s a bad idea to pull a tiger’s tail. Will the Mighty Bashnar have his way? Will his demonic competitors have their way? Or will the people of God use the weapons of their warfare to cast down strongholds? This book was so awesome!! Many of the things I read about I was and am going through right now!! It gave such encouragement to read this knowing it's fiction, but my gosh! So very very relevant! It was AMAZING to read and see many things I've been through was not rare and unique but experienced by other Sister and brothers(even if it is fiction he got the picture from somewhere!) I have already recommended this book to several of my friends who are also intercessors and prayer war Awesome read!! "LOVE OF YOUR ENEMIES IS THE PUREST FORM OF GODLINESS. GOD IS LOVE.HE WHO WALKS IN LOVE,WALKS IN GOD,AND GOD WALKS IN HIM." AMAZING!!! PRAISE GOD FOR THIS BOOK. I believe that Almighty God used Eric Hill to write these series! It is not far from the truth at all. This book have encouraged me spiritually. I love the scriptural back up used often. My husband and I read this together and it was amazing. WE RECOMMEND THIS BOOK. Wow! What an amazing book! This is a must read for anyone that loves an engrossing novel, or someone that is interested in spiritual warfare. Superbly written, the author moves seamlessly between the natural world and the spiritual world. This book is one you can't put down to the very end. There is no jumping off place anywhere in it. You are captivated and captured to the very end. If even a 1/4 of this book is true in real life, we need to learn how to pray. I lived this book. Stories that out Satan pin the run and cause our hearts to turn to God are great. If you have ever wondered if there is a world within and around our own that can not be seen with human eyes, then look no further, for the Bible tells us that this unseen world exists. One in which demons and angels dwell and can either benefit humans for good or evil depending on the eternal state of their souls. Eric M. Hill has woven a world that enables the reader to see that realm and see the influence it can have in our lives. While some may chalk this up as another exceptional fantasy novel, believers in Jesus Christ, know this is true. 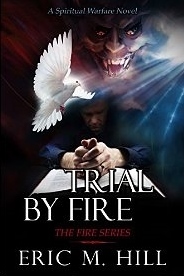 Fans of Frank Peretti will love the Fire Series, and with it the second novel, Trial by Fire. Since this is part of a trilogy, it would only benefit the reader to read them in order as the characters are ongoing and you need to understand things from the first novel to understand where this one is going. Trial by Fire takes readers into the culmination of what was slated to be the city of Atlanta's destruction by disease and plague but was thwarted by Jonathan Banks and Edwin Styles who rally together to fight the world unseen to most by is wrecking havoc on those around them. Beginning with Edwin's church. Since the initial plot from the demon known as the Mighty Bashnar failed, he has obtained heavenly permission from God to enact the Job strategy on those whom he calls his enemies. Like Job from the Bible, the Mighty Bashnar is given limitations to how far he can carry out his demonic plan and since there are those within the Styles family who have yet to give their lives to God, it's a no hold barred feast. With only the death of their son Christopher fresh in their mind, Edwin is losing sight of his faith as his family begins to become victims of a paranormal activity that has been orchestrated from hell against them. If he can't wake up before its too late he will lose more than just his family but the entire community in which his church resides. Jonathan isn't going to be as much help as before because he has his own spiritual battle he must face when his wife's mother falls into a coma that doctors are less than optimistic she will recover from. Knowing he has healed others, his wife Elizabeth begs him to heal her and when it seems that isn't likely to happen is willing to take matters into her own hands with another healer who promises results. Loved the first book but I thought that this one dragged a good bit. A good portion of the book was the happenings with the demon world not so much the humans. Towards the end of the book it focused more on the main characters Edwin and his family as well as Jonathan which helped the book pick up its pace. I will read the third one to see how the story concludes. Entertaining and inspirational. Ready for the next. These books teach a lot about prayer and trusting God. I want more of this in my life. This book is a must read....page Turner. You will not be Abe to put it down. Wonderful wonderful book. Thanks Eric for allowing God to use you. Eric M. Hill writes Christian Fiction That Grips The Soul. His spiritual warfare thrillers are acclaimed by readers for their can’t-put-the-book-down suspense, nonstop action, emphasis on the power of prayer, and illumination of Biblical truths.